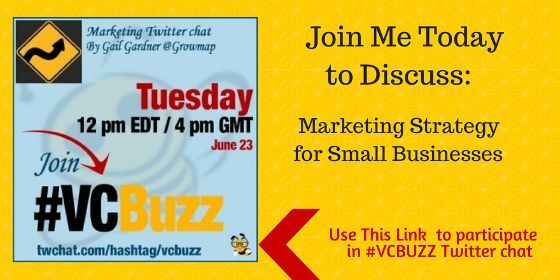 Please join me today as we discuss Marketing Strategy for Small Business on the weekly #VCBuzz Twitter Chat. See the questions we’ll be discussing on the ViralContentBuzz blog. If you haven’t participated in a chat before, it is easy. Simply put #VCBuzz in the search box on Twitter or easier still, go to this link on TWChat and click sign in. TWChat makes it easier to follow a Twitter chat by putting the moderator’s questions in the right column and all of the tweets in the left column. I hope you will join in and ask your questions about how to create a marketing strategy for your own business. If you ask a question either use TWChat to have the hashtag added automatically OR add #VCBuzz to your tweet. I will answer as many questions as possible during the chat, and will look for any I missed after it is over and answer them. Either way, you WILL get an answer. If you prefer to discuss strategy more privately, you can reach me on LIVE CHAT at SocialImplications.com after the Twitter chat is over. Fantastic ideas up there Gail. It looks interesting and exciting. I will surely try this! I was missed this can i access this anywhere sir. Or when next chat will available Hope next time i will not missed that chance. Even if you miss the live chat you can always see the tweets that were shared. Just search for the hashtag or look for the archive. So mad I missed out on this web chat… please keep posting when the next chat is available. Most Twitter chats are held weekly at the same time. They can also be reviewed any time by simply searching for the hashtag and scrolling down to the beginning of that day’s tweets. Many chats also produce archives of the complete chat or at least highlights and publish those on the site the chat uses as a host. Hi, I am new to blogging. I started purely to earn some extra money from blogging. you have mention wide information on blogging, its great. I have put lot of ads in my blog.But will it effect by Google panda ? kindly help me to earn some money. The most common ways bloggers earn money is providing services such as writing or managing social accounts. I don’t see ads on your site. Unless you have a lot of targeted traffic you are unlikely to make much money from ads. The most valuable audience is one that is specific to a particular location and interested in a specific subject. If you build that kind of audience then it will make sense for local businesses to run ads. I have to agree with Gail, in working with smaller business based clients, it always comes down to committing enough money to achieve their goals for the year. They know they need to step up, but struggle with the idea. Thanks for sharing informative information. There is important marketing strategy for small business to get good result as you want to according to post and use with Gail Gardner. I missed #VCBuzz, I was too busy building backlinks. Hope I’ll participate next time. Wish you all the best Gail! Should be very exciting Gail! I look forward to listening in! Thanks for commenting, Austin. If you have any questions let me know. Testing to see why some cannot comment.